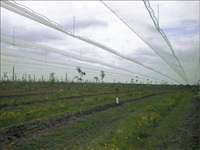 Mostly designed for cherry and stone fruit coverage, we provide a variety of drapeover bird protection. Depending on the size of the trees, row spacing, and the terrain upon which the orchard is being grown, we can provide a product to provide complete bird control. We do design custom nets of any weight, dimension, or opening size requested, and since we wholesale nets directly from Korea costs will be reasonable, please do not hesitate to contact us and see what we can do for you. 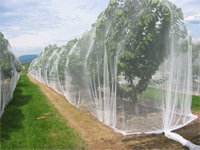 Drape over nets are our flagship product and what we recommend for covering fruit trees. For cherries, 10mx200m and 6.5mx300m are the two sizes needed for full coverage. Structures are something we can design and construct, but we recommend drape over nets instead due to the ease of application and removal, reduced costs, and superior durability. We can design and build custom structures to cover a variety of farming operations. Neal Carter and Associates Ltd. has several decades of experience as an engineering consulting firm, contact us for details.